Just a beautiful morning for a run in downtown Los Angeles. Over 9,000 runners (many clad in costumes) took to the streets for the LA Rock ‘n’ Roll Half Marathon/5K. I caught the Metrorail at Universal City in the wee hours this morning and rode it down to the Staples Center, chatting the whole way with several energetic (and sleep deprived) runners. As my third race in as many weeks (Long Beach Half on Oct. 12 and Santa Monica RunFEST on Oct. 19), I wasn’t certain how I’d approach this one. I struggled at Long Beach and had a good run at Santa Monica. 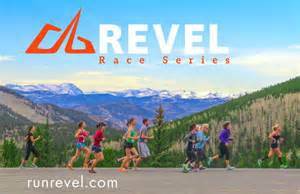 And with an uber-busy running November just around the corner, I really just wanted to have a solid race and a fun time. I decided to aim for a 2:10:00 finish time (roughly a 9:55 min/mile pace) and a “negative split. Look… me and my medal match. First things first, I made certain not to jump out of the chute too quickly (something I’ve been doing as of late). So I did indeed hold back over the first few miles. In fact, I managed to rein things in until the halfway point, keeping my pace right around a 10:05 min/mile pace. I then slowly picked up the pace, knowing that I’d have to come in around a 9:53 pace in order to meet my time goal. Well, here’s where things get a little funky. When running the LA Rock ‘n’ Roll Half last year, I noticed after the finish that the course appeared long… almost a full quarter mile long. Rather than being around 13.1 miles, my GPS read 13.39. Now I know you add distance to your race total when you weave and don’t take the shortest line (called “running tangents”). Well, I’ve gotten pretty good a running tangents and keeping track of how far off I am distance wise. I check at every mile marker. Yet I had another “distance” issue again this year. At mile 11, my distance read 11.10 (well within acceptable parameters) and I was running a 9:55 min/mile pace. I picked up the pace, continued running tangents and felt great. So I should have come in under 2:10… right? The skinny on my race. Somewhere between miles 11 & 13 I mysteriously gained an additional two-tenths of a mile in distance. My final distance tally was… you guessed it 13.39 miles (again). FYI, I verified this with several other runners and their GPS all seemed to read right around 13.4 miles. Now, we did run through a tunnel around mile 12 (where our GPS lost connection for about a minute). Perhaps that mucked up my timing. But then again, we ran through the same tunnel (in the other direction) around mile 7 and after we emerged, my GPS reconnected and everything was fine. Hmm. More on that in a later post (I think I’ll investigate this further). But to make a long story short, I ended up missing my 2:10 projected time by a few seconds. But my final pace according to my GPS (9:43 min/mile) was better than I had hoped. According to the race tracking, I did a 9:57 pace. I had a fun run; ran into some of my friends before the race and along the way. And I felt great out there pounding the pavement. I’m looking forward to my next race. Now I just have to decide what that race will be. 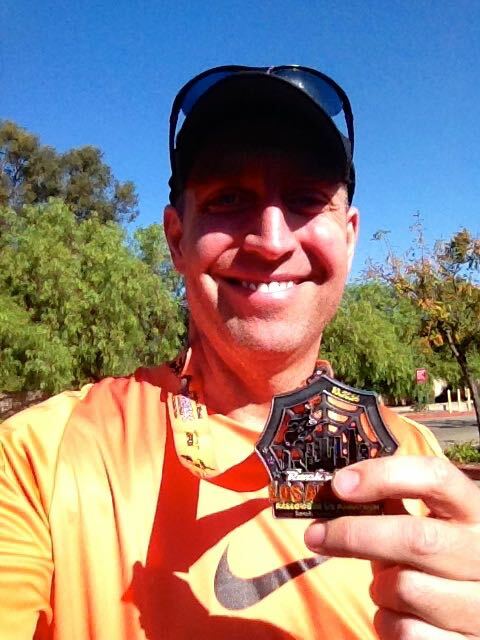 I’m currently slated to run the Santa Barbara Half Marathon on Nov. 8th. But with three races lined up (in two states) over a 30-hour period the weekend of Nov. 15-16, I may pass on Santa Barbara to rest up. Then again I may run it (slowly) as a taper run. Let’s just say it’s still TBD (I’ll let you know what I decide). Have a great Sunday… and Run on! 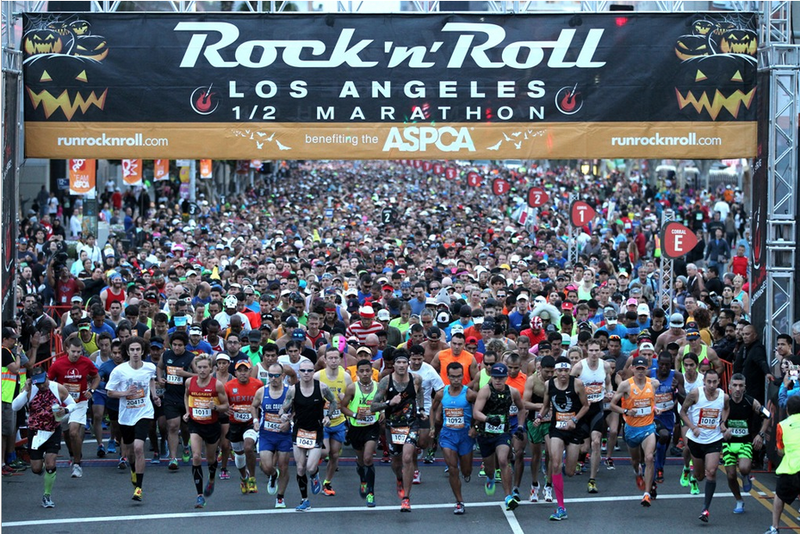 Note: Review of LA Rock ‘n’ Roll Half Marathon will be up on Tuesday. 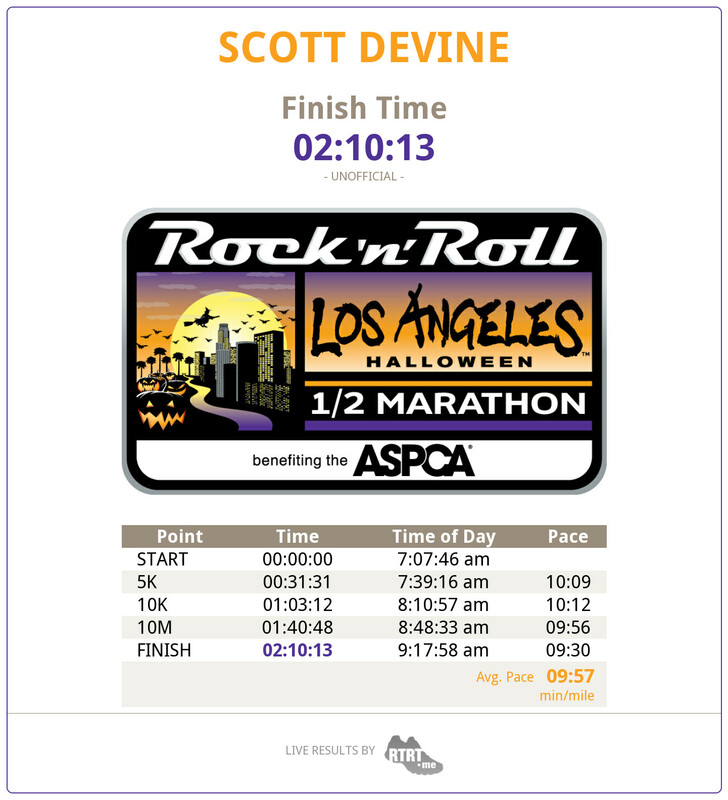 Posted on October 26, 2014, in General, The Race "Experience" and tagged GPS, Los Angeles Rock 'n' Roll Half Marathon, Tangents. Bookmark the permalink. 2 Comments. My Garmin clocked in at 13.24, which is within what I’d expect given the many turns and who knows how they measure it around the Coliseum. That said, I DID notice that the individual mile markers weren’t exactly spot-on. I’d be surprised if there’s a real issue with the course measurement. Most halfs I run show up as right around 13.2 on my Garmin. Long Beach, for example, was 13.21. Ventura, on the other hand was right on the money. Sorry I didn’t get to see you yesterday. Saw your pic at the start line; I was just a corral or two behind you. I don’t know what it is with the distance. What got me was that the big jump in distance came during the last 2 miles only (I was only .1 over at mile 11)… same thing happened last year. Oh well. It was still a fun run. What’s next for you?